Red onion, Kalamata olives, tomatoes, croutons, avocado, bacon and chopped egg topped with Jack and Cheddar. Crispy white meat tenders on a bed of fries, served with choice of dipping sauce. Or have them buffalo style. Our Signature House salad prepared with chopped egg, bacon, mixed cheese, tomatoes and croutons. Choose chicken or beef, smothered with cheese, sour cream, tomatoes, jalapeños, black beans and shredded lettuce. Sign up for a tap card with us to earn points towards rewards! Click On Tap Card and Enter Your Tap Card Number to Get Credit For This Order. If you need a Tap Card type "PLEASE BRING ME A TAP CARD" and add Birthday Month/Day and Anniversary Month. 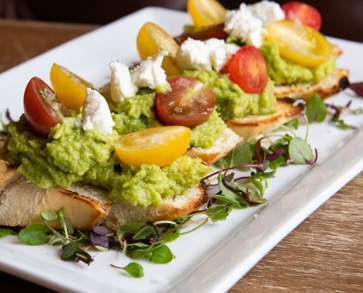 Truffle goat cheese, avocado, and heirloom grape tomatoes. Corned beef, Swiss cheese, sauerkraut, and thousand island. 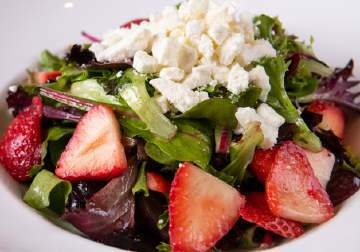 Grapes, strawberries, and feta cheese tossed in apricot vinaigrette. Hand-pattied and topped with Swiss cheese, frizzled onions, spicy mustard, and a whiskey glaze. 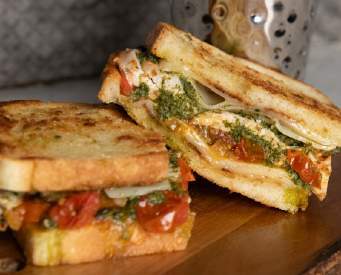 Pesto grilled chicken, Gruyere cheese, and tomato relish. 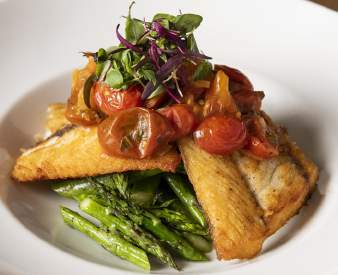 Topped with tomato relish and citrus micro greens and served with grilled asparagus. A classic Italian dessert created by Paola Motta, General Manager. Enjoy family-sized pans of our favorites! Served in aluminum 1/2 size pans - that can feed 6-8 people! A rich and hearty broth full of onions and beef topped with gruyere cheese and frizzled onions. A powerhouse of fiery Southwestern flavor. Sushi grade yellow find seared to a perfect rare. Spinach and artichoke hearts in a rich Reggiano Parmesan cream sauce served with tortilla chips. Topped with our own marinara sauce and Parmesan. Lightly breaded and served with chipotle aioli. House made hummus, carrots, celery, Kalamata olives, tomatoes and red onion with warm flat bread. Stuffed with chicken, carmelized onions, bacon and cheese. Spicy Andouille sausage, blackened chicken, peppers, onions and cheese. BBQ chicken, caramelized onions and cheese topped with coleslaw and frizzled onions. 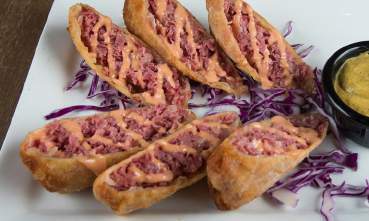 Stuffed with shaved prime rib, cheese, and onions, served with a creamy horseradish dipping sauce. Mini bison burgers with a touch of chipotle topped with avocado aioli, American cheese and frizzled onions. Add your favorite to any salad! House made Caesar dressing, topped with croutons and Reggiano Parmesan. Blue cheese, walnuts, tomatoes, chopped egg, red peppers, carrots and bacon tossed in blue cheese vinaigrette. Topped with bourbon marinated steak and frizzle onions. All of our Home Grown Burgers are 100% all natural. We work with local farms from New Jersey to Maine. They, as we do, take pride in the fact that the following contain no hormones, antibiotics or steroids. All of our Home Grown Burgers are served on our Toasted Brioche Roll, paired with crisp French Fries and a Truffle Cream dipping sauce. Mixed with our secret ingredients served with Lettuce, tomato, cranberry mayo, herb aioli and red onion. Served with French Fries. Substitute Sweet Potato Fries for just $1.59 or Parmesan Tater Tots for $.99. Crispy buffalo chicken, lettuce, tomato, Blue Cheese crumbles and Ranch dressing. Cheddar cheese, frizzled onions, applewood smoked bacon and BBQ sauce. Topped with American cheese, lettuce, tomato, diced onions, pickles, mustard and mayo. Topped with applewood smoked bacon, Cheddar cheese, caramelized onions, lettuce, tomato, pickles, mustard and mayo. Corned Beef shaved thin and piled high with sauerkraut, melted Swiss and Thousand Island. Black beans, corn, sweet potato and chipotle topped with fresh guacamole, pico de gallo and tortilla strips. Hand carved turkey, applewood smoked bacon, tomato and lettuce on wheat berry bread with cranberry mayo. Fresh Atlantic salmon with leaf lettuce, tomato, pickle and a dill tartar sauce. Choose grilled or blackened. Grilled or blackened topped with Jack cheese, lettuce, tomato, pickle and Honey Dijon. Melt in your mouth! With caramelized onions and Gruyere cheese served with French fries and onion soup for dipping. Three tacos served with french fries. Sub sweet potato fries for $1.59, or parm tots for $0.99. Braised short rib, quajillo sauce, pico de gallo, avocado sauce, cilantro. Adobo chicken, jicama slaw, chipotle aioli, cilantro. Blackened fish, mango salsa, pickled onions, chipotle aioli, cilantro. Mushrooms, tomatoes and blackened chicken in a Cajun cream sauce, tossed with linguini. Spicy! Four Cheese with a hint of chipotle pepper. Penne pasta and local peas in a tomato vodka sauce, topped with Parmesan. Hand-tossed oblong pies made with House Prepared dough and delicious ingredients. Our pizzas run the gamut - from traditional cheese to Mac Pizza! This Wood-n-Tap original combines your two favorite foods in one dish! Creamy chipotle mac-n-cheese, applewood smoked bacon and buttered Parmesan bread crumbs. That’s right! 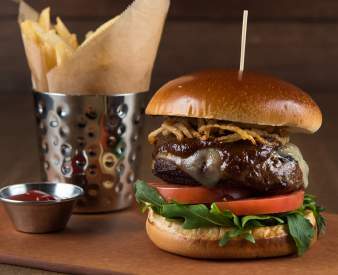 Jack and Cheddar cheeses topped with our chopped grilled house burger, with caramelized onions and crisp bacon. All topped with chopped pickles, Honey Dijon and ketchup. Hand cut fresh salmon, lightly seasoned atop a bed of parmesan risotto. Served with grilled asparagus. All of our steaks are prepared to your liking and served with our famous garlic mashed potatoes and grilled asparagus. Substitutions gladly made upon request. Hand selected and aged for exceptional tenderness and thickly cut to ensure juiciness. Your own personal pizza pie with red sauce and fresh mozzarella. Gobs of gooey cheese melted on toasted white bread. Are you a giant or are the burgers smaller? Two awesome mini-burgers topped with cheese. Tender semolina pasta loaded with a creamy blend of cheeses. Choose from crispy chicken tenders or a piece of grilled chicken. Tomatoes, croutons, egg, bacon and cheese on a bed of mixed greens. Served with crispy chicken and your choice of dressing. Chopped eggs, bacon, mixed cheese, and tomatoes. Red onion, kalamata olives, tomatoes, avocado, bacon and chopped egg topped with jack and cheddar cheese. House made Caesar dressing, topped with reggiano parmesan. Blue cheese, walnuts, tomatoes, chopped egg, red peppers, carrots, bacon tossed in blue cheese vinaigrette. Topped with bourbon marinated steak.